Spoke a little too soon last review and found this one. Sorry if I skipped around a bit. Sunspot is back, and the team of the New Mutants welcome him home in the skies above. It takes us about three pages just to get to the point, but really what’s happening here is an introduction to the plethora of characters. I normally appreciate the way Claremont handles this, but it’s getting old. Sunspot comes bearing gifts and after a brief scuffle with Cannonball over Cannonball’s new relationship with Lila Cheney. (We really did miss that issue, honest.) The boys are stopped by Magma, but Sunspot claims he was only joking. That’s the thing with Sunspot, he takes things a little too far. Then he finds out what happened to Tom and Shannon at the hands of Empath. Sunspot gets the team worked up (as if he was Empath) to bully the bully. What transpires over the rest of the issue is a team sinking deeper and deeper into punishing someone by their own hand. Empath is forced into Limbo where he’s confronted by his own demons. There’s a neat little scene where he tries to gain a foothold in Mirage’s mind, but it’s just another demon. As the gang furthers along their act of revenge, Cypher finally breaks the code of their depravity, much to Sunspot’s chagrin. It all boils down to bullies bullying bullies. It’s hard to imagine in Sunspot’s fury that he’s still only thirteen. Glad to see things have gotten better by the next issue. Cypher breaks this rather cruel tactic of meeting Empath at his level, much to the chagrin of Sunspot. 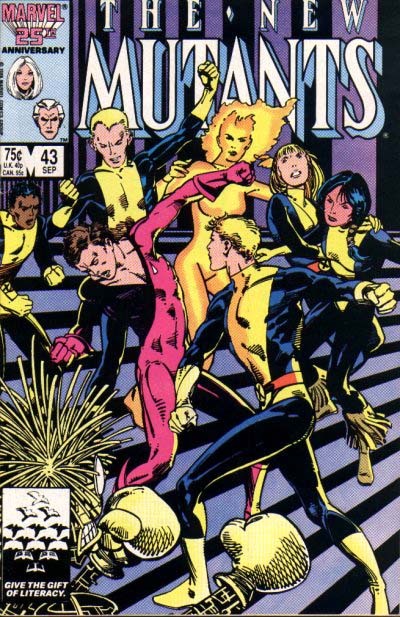 Thankfully, the New Mutants are stopped by the Hellions before they can do any last damage. Hard to believe Sunspot’s only thirteen sometimes, but then again, he doesn’t understand his actions. Thank goodness I saw something good come from him in the next issue.